Are You Interested in Earning Some Pocket Money? We are looking for elderflowers to make our Elderflower Cordial. If you know where there are elder trees, we will pay you to pick from the hedges and in the wild and bring the flowers to us. Elderflowers are widespread in the hedges at this time of year. They grow on the elder tree or the boor tree as it is also known. Please check with us before picking to make sure you’re picking the right flowers. Before you start picking, contact us at 087 – 8316688 (David) or 087 – 6464757 (Martina) to ensure we are in production that day. Only pick on dry days, morning or early afternoon is best. Before you enter someone else’s land, get permission from the landowner. Check the field for livestock and assess whether it is safe to enter on to the land. Please keeps gates closed, or leave them open if that is how you find them. This is what an elderflower look like. We need flowers that are dry, open and white. Sometimes the best elderflowers are at the top of the tree and this is where you could use a hook to pull down branches – don’t damage the tree though! 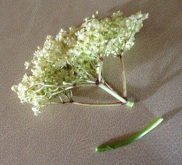 Cut the elderflower just below the flower, as we do not need the long stem. Place the flowers in an airy basket or cardboard box. Do not use plastic bags as the flowers will sweat and wilt. We pay €3 per kg.